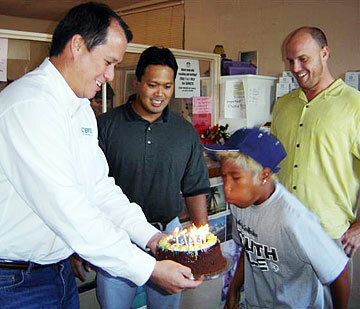 Fred Noa of CB Richard Ellis presents a birthday cake to Phillip Gaballo at the Maili Land Transitional Housing Shelter. Phillip Gaballo beamed as he prepared to blow out the candles on his favorite cake -- chocolate -- for his 13th birthday -- the first recipient of the Birthday Cakes for Homeless Children. His mother, Virginia Piimauna, said: "We were very excited" when she was first notified, and "we wanted to keep it a secret, but we couldn't!" Gaballo, a seventh-grader at Waianae Intermediate School, lives at the Maili Land Transitional Housing Shelter with his mom and his two sisters. When CB Richard Ellis representatives delivered the cake last month, Piimauna said, "It was very nice of them to do this." The program was initiated by the CB Richard Ellis real estate company on the mainland last year as a way to give back to the community, but this was the first time in Hawaii it's been done. Gaballo said he planed to use his birthday money to buy a "Game Boy" pocket video game player. His mother said they usually celebrate by "baking each other cakes," and his sister would still probably make another one for him. Joe Haas, CB Ellis' Hawaii president, said his company had "a great deal of difficulty" trying to find an agency that would allow them to start the cake giveaway. Most of the agencies that they first approached did not want to divulge the identity of their clients, but Catholic Charities did not have a problem with confidentiality, he said. "Many organizations will contribute money because it's easier to give than time or attention," Haas said. He and his employees will buy a total of 85 cakes throughout the year and take turns delivering them personally at Maili. "The act of giving (by his staff) will make it more meaningful to the whole program," he added. "And it's good for the kids ... Imagine a homeless child and how they might react to such a kindness." The Maili Land Transitional Housing Program has been run by Catholic Charities for 20 years. It is a 44-unit facility in Leeward Oahu which provides housing and assistance in finding long-term housing to families with children under 19.